Two drinks giants don’t often come together but when they do, it’s epic. 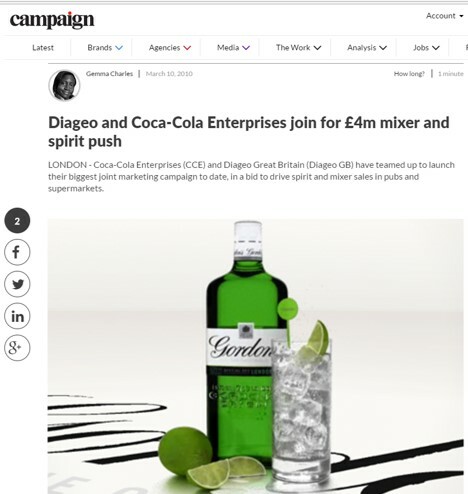 Diageo GB and Coca Cola Enterprises (CCE) embarked on a groundbreaking collaboration for a special summer campaign, titled ‘Always Better Together.’ The £4m joint marketing campaign aimed to drive spirit and mixer sales in pubs and supermarkets. The hero products were Smirnoff vodka and Coca-Cola, Gordon’s Gin and Schweppes tonic, Pimm’s and Schweppes lemonade, and Bell’s and Coca-Cola. Developed strategic messaging and campaign plans for trade PR, creative and media buying. Set up and delivered a highly successful launch press event with keynote speeches, ‘perfect serve’ demonstrations and Q&A.